In TBS' new police satire Angie Tribeca, no TV drama trope is left unscathed—including product integrations. 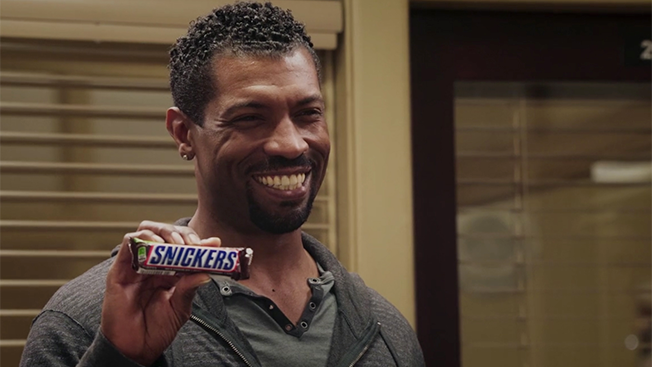 In the third episode, two detectives (played by Hayes MacArthur and Deon Cole) strike up a ridiculous conversation about Snickers, with each repeating its "Snickers really satisfies" tagline over and over, punctuated by a shot of the candy bar's logo and hashtag. It was a funny and effective integration for the brand, one of three in the show this season. The tie-in with Mars' Snickers is just the latest example of brands wanting in on the joke and growing hungry for integrations in comedic content on TV. Such integrations have become a staple of late-night shows, including a promotion around Sabra hummus in the high-profile premiere of CBS' Late Show With Stephen Colbert last September. The recent USA Network comedy Donny!, starring former ad exec Donny Deutsch, featured weekly integrations from brands like Purity Vodka and Dyson. "There's a lot of research that supports the fact that humor is one of the awareness triggers in advertising for people to remember and recall commercials. 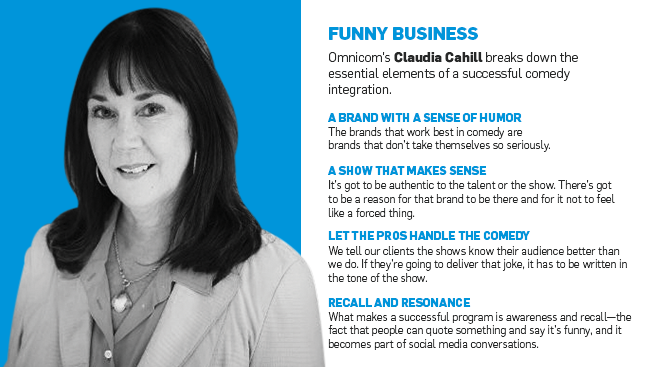 If you make people laugh, they typically will remember it," said Claudia Cahill, chief content officer for Omnicom Media Group, whose job entails placing integrations in late-night and daytime talk shows. Angie Tribeca creators Steve and Nancy Carell were looking for laughs, not brand partnerships, when they came up with a recurring joke about an aggressive Ford integration in the show's pilot. "It was just supposed to be a joke, riffing on product integration," said showrunner Ira Ungerleider. "And then TBS was asking, 'Is there an opportunity to do product integrations?" Turner, which has a three-year partnership with Starcom that includes developing brand integrations in series on its networks, saw great potential for tie-ins around Angie Tribeca. "When our sales force went out with it, it immediately got a lot of traction," said Jennifer Cohen, svp, content partnerships for Turner Entertainment ad sales. The show's producers were open to working integrations into Angie Tribeca episodes, but "only if we could point to it and make fun of it. We're not going to slyly try and sell these people's products—we're going to make fun of the whole notion of product integration, so we're going to hit it on the head several times really hard," said Ungerleider. While tie-ins in comedies are a little trickier than those in drama series considering the potential for failure if the joke falls flat, "we're seeing that brands are more willing to take that chance," said Cohen. "They've seen the positive reaction that it gets from consumers, and they're willing to take that leap." Even marketers that once would've hesitated are becoming more willing to put themselves at the mercy of comedy writers. "Our clients are pretty much savvy enough now that they understand to be heavy-handed with a brand message in an entertainment property is just not the right way to do this. They get the fact that there has to be some level of creative interpretation," said Cahill. That said, there are advertising categories that likely will always remain ill-suited to a TV sitcom—"brands that have a very serious business and a serious reason" to avoid funny material, Cahill suggested. "I can't imagine that airlines would want to be integrated in a comedy." This story first appeared in the Jan. 18 issue of Adweek magazine. Click here to subscribe.